You'll be £14.99 closer to your next £10.00 credit when you purchase From the Krays to Drug Busts in the Caribbean. What's this? Ian Brown spent almost thirty years in the police force, rising through the ranks to work on some of the best-known crimes of the twentieth century. From witnessing the brutality of the Kray twins to chasing the spoils from the Brink’s-Mat gold bullion robbery, Brown was never too far away from someone's illicit deal or a hardened crook. Renowned for being one of the luckiest members of the Sweeney (Flyinq Squad), he foiled London’s most dangerous armed robbers, had the ear of the Met’s most prolific informants and helped put away murderers including the notorious killer Kenneth Noye. Commended for his bravery, Brown headed a drug squad in the Caribbean, where he became immersed in South American drug cartels and money laundering on an epic scale. He captured – and destroyed – the biggest haul of cocaine in Caribbean history, seized tons of cannabis and helped locate the whereabouts of America’s Most Wanted. Written with honesty and disarming humour, Brown’s personal experiences offer an insight into the real world of true crime. Ian Brown spent almost 30 years in the Force, rising through the ranks to work on some of the best-known crimes of the 20th century. From witnessing the brutality of the Krays to chasing the spoils from the Brink's-Mat gold bullion robbery, Brown was never far away from an illicit deal or a hardened crook. Renowned for being one of the luckiest members of the Sweeney, he foiled London's most dangerous armed robbers, had the ear of the most prolific informants and helped put away murderers including the notorious killer Kenneth Noye. Commended for his bravery, Brown headed a drug squad in the Caribbean, where he became immersed in drug cartels and money laundering on an epic scale. He captured and destroyed the biggest haul of cocaine in Caribbean history, seized tons of cannabis and helped locate America's Most Wanted. His connection with the Kray case was peripheral: he was an Aide to CID (trainee detective) engaged in guarding one of the witnesses before the trial. For the rest of his career, however, he was in the thick of it. He had two tours of duty with the Flying Squad and was later part of the team investigating the Brink’s Mat gold bullion robbery. His secondment to the Royal Virgin Island Police saw him leading a very successful drugs squad. 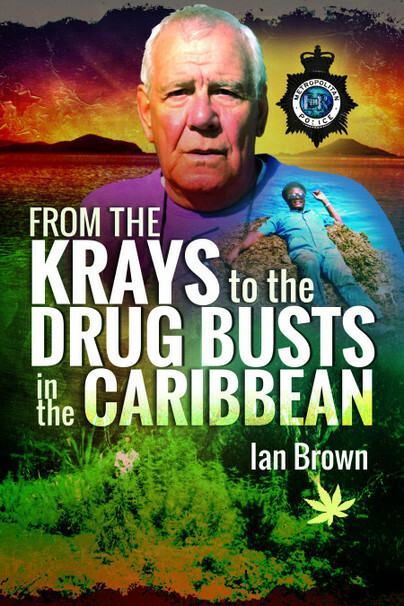 Ian Brown’s police career started as a beat constable in Cumberland before transferring to the Metropolitan Police and completing his service as a Detective Superintendent in The British Virgin Islands where he headed a very successful drug squad. His involvement in high profile and regulation cases led to some thirty commendations from courts and law enforcement agencies around the world and earned him a Queen’s Commendation for Bravery. Now an ‘enrichment speaker’ for Cunard, P&O and other cruise lines, he regularly presents to packed houses. He is also an accomplished after dinner speaker. Ian is engaged as a police advisor on several television crime programmes. He lives in Kent with his wife and his main interests are criminal research and sport as he is also a professional Lawn Tennis Association coach.